For all the bass lovers out there, Samaki has created something special, something you’ve been asking for, that one-of-a-kind shirt that is right up your estuary! With natural tones of sweeping reeds, heavy structure and crystal clear sky, the Aussie Bass shirt is designed to stand out of the crowd but blend into the surrounds. As the bass strikes the lure, it sends water splashing across the surface in a flurry of action. The prominent deep green of the bass is accentuated with contrasting gold highlights. The lightweight fabric is perfect for all outdoor elements, protecting you from the harsh sun with Samaki’s UPF50+ resistant technology. The soft-touch 100% polyester material is comfortable on the body, plus has the added feature of being breathable, keeping you cool and dry. Samaki designs are brought to you by Australian anglers who love to design Australian species. 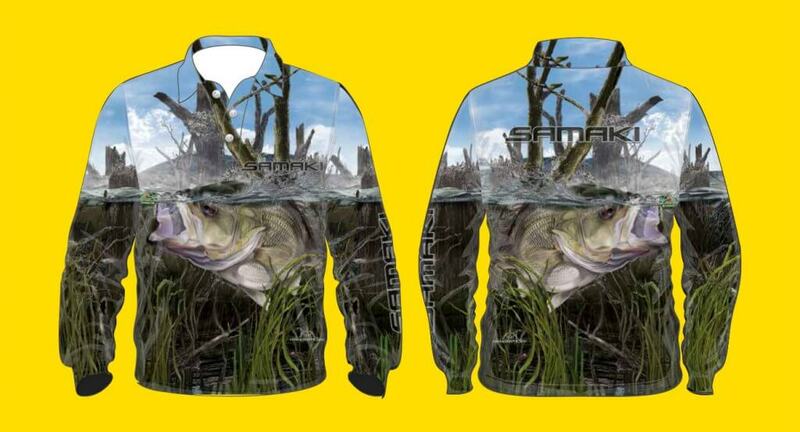 Aussie Bass shirts are available in adult, youth and kids sizes, from a size 2 through to a 5XL, allowing the whole family to get in on the action.